When traffic needs slowing down on access roads or in parking lots there is no better solution than a speed bump. Our Modern designed speed bump is easy to install and made entirely from PVC material. Complete Kits (coming soon)- Our kits include everything needed to install a complete speed bump. 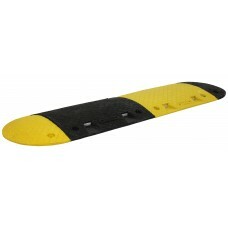 If one of our kits fits your desired speed bump length then a kit is your best option. Individual Components - We also sell individual speed bump components to build any size speed bump. The uniform 2” height makes our speed bumps safe for all cars and drivers. 2” profile means no damage to cars. The yellow and black construction and built in reflectors on each speed bump unit makes them highly visible on the road ahead. The built in reflectors ensure their visibility in the dark. These units are bolted down and very quick and easy to install with only basic tools (a drill and ratchet) and safety gear. The single piece construction of each module makes them very durable wearing and able to stand up to use in almost all climates. We are here to help! Speak to our sales team at (800) 671-9662 toll free!